GRAFILIT® MULTIFORCE is the answer to the most demanding challenges in the field of static sealing. Graphite as a thermally stable and chemically resistant material mechanically reinforced with multiple stainless-steel inserts, confirms this explanation. As we know, graphite morphology leads to the anisotropy in electrical, thermal, and mechanical properties of graphite and explains its natural lubricity. These positive features represent GRAFILIT® MULTIFORCE as a distinctive material with the essential characteristics of graphite and stainless steel foil with some unique properties which makes it a valuable material for most demanding applications. 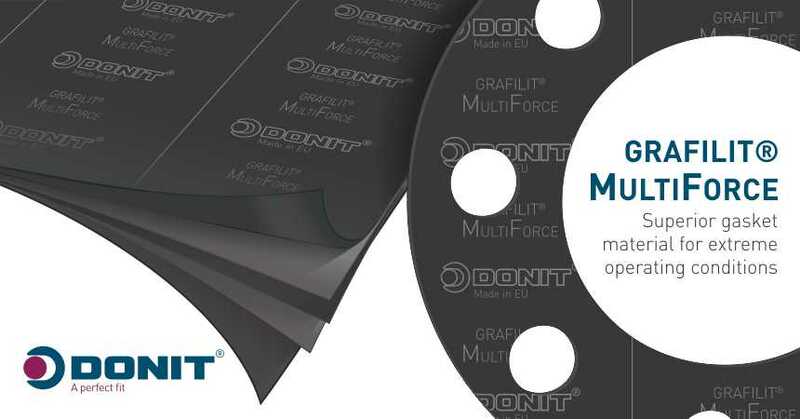 GRAFILIT® MULTIFORCE flexible graphite is manufactured employing a process that introduces no organic or inorganic elastomeric binders, fillers, or other potentially fugitive ingredients that could limit it’s thermal and chemical stability. Standard properties of manufactured graphite include thermal stability, thermal conductivity, natural lubricity (self-lubrication effect) and chemical resistance to fluids and gases, the flat stainless-steel foils add more strength and mechanical resistance. GRAFILIT® MULTIFORCE combines these properties with the added characteristics of flexibility, resilience, compactness, easy processing and handling. These characteristics differentiate it from other forms of graphite, making it a superior, high-performance sealing material.